By all accounts the HIP District’s celebration of Old School Laguna was a success. “Based on viewing the large numbers of people that enjoyed the music, that saw friends and neighbors walking the district on the beautiful sunny day, their comments and the preliminary sales reports from merchants, it was a remarkably successful and delightful day,” said Joe Hanauer, developer of the Old Pottery Place and a prime mover in the effort to give the area an identity. The HIP District, standing for Historic and Interesting Places, was formed some seven years ago to draw attention to the one-of-a-kind shops, services, dining and lodging establishments available in Laguna’s first business district. Thirty-seven establishments on South Coast Highway from Thalia Street to Bluebird Canyon participated in Saturday’s event – which could be described as Hospitality Night in the Afternoon. “Events like this are so good in the age of Amazon,” said philanthropist Mark Porterfield, who strolled the HIP District with Steve Chadima. Kudos to Susan Elliott, owner of TWIG for coming up with the idea. “It was her vison,” said TWIG employee Barbara Pierce. Hanauer also applauded Elliott for her leadership. But it was more than vision that made the event happen, it was follow through – which included Elliott applying for city permission to hold the event and publicizing it during public comment period at a City Council meeting. Posters were plastered all over town. In all, Elliott spent about two and half years bringing the project to fruition. Mayor Bob Whalen opened the day at The Soul Project. Councilman Peter Blake joined Whalen for the ceremonial ribbon cutting. Among the locals: Diane Judy Riegler and Carol Dugger, trying on sunhats at SPF Addict, owned by registered nurse Marina Arnold, with a self-proclaimed mission to protect skin. Riegler and Dugger (there’s a well-known name) grew up together and attended Aliso Elementary School. Beginning with Thalia Street Surf Shop on the 900 block of the Highway to Cove Gallery in the 1550 block, businesses were putting their best feet forward. Attractions included the Bingo game, with stickers available at participating establishments. Thirty-five winners of gifts from the HIP District merchants were to be contacted Monday to receive their prizes. Besides Bingo, nearly every business offered some memento, sale items or discounts to visitors. Handmade Hearts Art Gallery handed out free posters. Hudson Donnelly, 9, picked up a custom-made button at the surf shop as parents Nicole and Sean Donnelly watched. De Francis, owner and chocolatier of the Chocolate Soldier, kept her promise to fans to make her unique graham slams-s’mores on steroids, as well as Moogies and Mint Patties, with prices rolled back to Old School Laguna days. Special offers included a month of free 9 a.m. spin classes at Art of Fitness; Kool-aid and a certificate with a purchase at Lala, a Kerry Cassill store; free nachos and beer for $3 at El Ranchito and a 20 percent discount on purchases at Spice Merchants. “This is a better location than downtown,” said Lindsey Anderson, assistant to the owner, Paul Greer, who moved the shop from Ocean Avenue. Even more new to the district is Diana Garreau’s store, Stone Unturned. “I opened about 10 minutes ago,” joked Garreau, a designer of jewelry and textiles and a resident of Laguna for about 30 years. Actually she opened the door that morning. “She’s a one-woman band,” said author and resident Susan Velasquez, a longtime admirer of Garreau. Cathy Krinsky was among the folks also attracted to the wares displayed in the shop. The Garage Collective was a newbie: it was moved to a new location on the highway three weeks ago, in time for Old School Laguna Day. “A lot of people who didn’t know us are here today to enjoy the event,” said Kristin Lewis, Collective manager. Up and down the highway, business owners enthusiastically reported more foot traffic. “While it’s hard to determine how many people joined in on the day, guesses are a few thousand people, primarily locals, strolled throughout the district going into shops they simply didn’t realize existed,” said Hanauer. Marko Sims of World of Earth attributed some of the success of the event to the weather and pet lovers. “This is the first beautiful Saturday in about four months and we are the most dog-friendly town in the world,” said Sims. Rachel Zepeda of Billabong said not everyone was buying, but the exposure was great. Adding flare to the occasion was uninterrupted music, performed throughout the HIP District between noon and 6 p.m.
Retro music was played on a turntable at The Soul Project, starting at noon. Foolish Dog set up on the steps from noon to 2 p.m. outside of Sound Spectrum, a Laguna Beach institution for almost 52 years. “This [district] is really where Laguna locals come to play,” said Wave, also an institution. The only change he said he would make would be to call the neighborhood the Surf Zone, waving (you should excuse the expression) his hand toward the nearby ocean. Greg White said the event was terrific and the store made a lot of sales. Giveaway LPs were up for grabs outside the store. Marlena Headrick sang at Kiska Boutique from 1 to 3 p.m.
“Men were hanging out to listen to music so women got longer to shop,” said Lisa Zimmermann. Up the street, Beth and Steve Wood of Honk drew a crowd from 2 to 4 p.m.
Nini Dake of Tootsies shoe store in the development said the music was amazing. “It’s a huge draw, Dake said. Jerry Clovis & Associates entertained from 3 to 5 p. m. at the Art Center. The event concluded with Ghost of Belle Star playing at TWIG – where it all started. Bravo Susan and encore. But wait – there’s more. 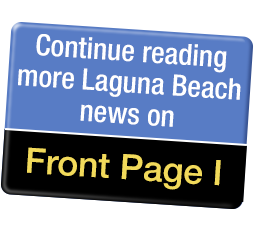 You will find advance notice of all the fun and interesting stuff for visitors or residents to do in Laguna by reading StuNewsLaguna.com. Contributions are welcomed. On April 18 from 4 - 5:30 p.m., LOCA invites artists to an Art Club “Open Critiques” at the LCAD Gallery. Artists are invited to bring in their works for helpful discussion and feedback from Betty Shelton, Chair of the Post Baccalaureate program at LCAD, along with additional panelists. Refreshments and hors d’oeuvres will be provided. The cost is $20 to the public and free to LOCA members. Registration is required. For more information on LOCA and to register, visit www.locaarts.org/event. LOCA Arts Education is a nonprofit coalition of arts educators, professional artists, and advocates interested in arts education for people of all ages. The nonprofit has been serving the community for over twenty-five years. LCAD Gallery is located at 374 Ocean Ave.
Alix Dunn is stepping down as President and Chief Executive Officer of Crystal Cove Conservancy, effective May 15. Dunn, who has served in this role for almost three years, will remain with the organization in an advisory capacity. During her tenure, Dunn spearheaded a number of major initiatives. These included a re-brand of the organization from Crystal Cove Alliance to Crystal Cove Conservancy, aligning the Conservancy’s for- and nonprofit operations, overseeing the educational programs to increase student outreach by 175 percent, and growing private donor and corporate contributions to the Conservancy by 150 percent. The new CEO search will be undertaken by a sub-committee of the Crystal Cove Conservancy Board. On Saturday, March 30, the Laguna Beach Parents Club held a clothing drive for Women Helping Women (WHW) at Anita Wang, MD Wellness Center in Laguna Beach. WHW is a nonprofit organization that provides the unemployed and underemployed the skills and resources they need to get and keep a good job. Since 1993, WHW has served over 100,000 job seekers, many referred by over 275 partner agencies at no charge. Over $3,000 worth of prizes were donated by various local businesses for the event and over 500 items were collected and donated to the nonprofit organization. Since 1993, WHW has served over 100,000 job seekers, many referred by over 275 partner agencies at no charge. Laguna Beach Parents Club is a nonprofit organization for families with young children who live or work in Laguna Beach. The club hosts play groups, nights out for parents, fitness groups, and holiday activities such as the Easter egg hunt and Halloween Walk. LBPC also raises money for various local nonprofits through their community work. The club will also host its Annual Gala on May 18, which will support another local charity. Dr. Anita Wang specializes in preventive medicine, anti-aging, and skin health. Dr. Wang is a Board Certified Emergency Physician, and has been extensively trained in Aesthetics. She graduated from the University Missouri – Kansas City School of Medicine and has spent the over 20 years as an ER doctor at UCLA medical center. To learn more about Laguna Beach Parents Club or to become a member, visit www.lagunabeachparents.org. For more information on Dr. Wang, visit www.anitawangmd.com. For more information on Women Helping Women and how to support their job seekers, visit www.whw.org. For eight years, Tom Berndt, a realtor with Coldwell Banker in Laguna, has been supplying reading glasses for recipients half way around the world at Village HopeCore (VHC) at the base of Mt Kenya (over 6,000 ft) in Cogoria, Kenya. Village HopeCore started in the year 2000, with Founder and CEO Dr. Mugambi, the current Medical Director Dr. Phil Rasori, 12 women, and $5,000 USD. Since then, they have launched, grown, and evolved the all their programs to support the health of children and their mothers. Berndt relies on local realtors for donations. “All of the 1,500 reading glasses, 400 hats, and over 400 sunglasses were donated by my fellow Realtors in Laguna Beach and Laguna Niguel. They drop off items to my office all year long. “This year was the first for hats. I learned the children were contracting cataracts because of the high altitude sun. Every child in the two orphanages got a hat. Many got sunglasses. However the adults were first, as a pair of sunglasses is a status symbol. Only the adults get reading glasses. Kathy will take needy children to a doctor for prescription glasses. For more information about Village HopeCore, go to www.villagehopecore.org. BAA Founder Lisa M. Berman of Laguna Beach is collaborating with Engel & Volkers to present specially curated art shows monthly within their office and online. This month, Berman is proud to present photography by Bonnie Schiffman, with 20 percent of all sales on her work to be donated to Glennwood House of Laguna Beach. Over the past three decades, Bonnie Schiffman has photographed hundreds of celebrities, rock stars, comedians, actors, directors, and artists – all contemporary cultural icons – from Her photos have been featured on over 200 magazine covers including dozens for Rolling Stone. Schiffman’s image of Muhammad Ali is in the collection of 42 museums worldwide and was used to represent the International Museum Project for the past three years and in the TAG Heuer watch ads globally. Berman Arts Agency of Laguna Beach recently negotiated a museum show for their client in New York at the National Comedy Center to debut in late April. The NCC was just named the Best New Museum in the United States and 2nd best new attraction by USA Today Travelers’ Guide. Schiffman’s museum show will focus on celebrated comedians and will showcase some of her images from her Rolling Stone Book of Comedy with Robin Williams. Find out first-hand how Schiffman disarms her celebrities and begins each session with her “secret sauce”…it’s always lunch. The show is on view now and can be seen daily during Engel & Voklers office hours. Bonnie’s images will be available for purchase in person or at www.artsy.net/berman-arts-agency. The collection ranges from $100 - $3,500. On this date (April 5th) in 1997, Laguna’s surface ocean temps already reached the 70-degree mark thanks to arguably the strongest El Nino event of the 20th century, right up there with the equally strong 1982-83 El Nino. In 1997 the water temp would maintain 70 or higher until November 20th. That’s an incredible run of 229 days! No other year has even come close. Now it’s April and our 2018-19 rainy season is winding down. This season was pretty good to us dropping 17.15 inches so far. Seeing as April averages only around 1.2 inches, it is doubtful we’ll reach the 20-inch plateau, but the season doesn’t officially end until June 30th, so anything can happen. Historically, we’ve had a handful of wetter than normal Aprils. There was April of 1958 and 1965 with 6.02 inches, April of 1983 with 5.16 inches, and April of 1988 with 3.41 inches. Local surface ocean temps are right about where they should be for early April at 58-60 degrees. We’re still waiting for that first elusive 80-degree day. Normally by now, there are about a half dozen of them. This is the latest ever that we’ve gone without even one. The warmest so far has been 74 last week. After a promising start to the season for winter swells in December, the ocean pretty much went into a coma after New Year’s. I gave the winter of 2018-19 a D grade. We have yet to get any real action from the Southern Hemisphere, just a few minor pulses and that’s about it. April usually gets the first couple of strong swells from there. Less than six weeks from now, the 2019 Eastern Pacific hurricane season gets underway. Last season had plenty of tropical systems, but they all moved the wrong way. We used to get at a least a half dozen decent Baja swells even in a slow season but lately we can’t even buy one. The last significant Baja swell was way back in September of 2014 from hurricane Simon. Stay tuned on that one. Have a nice weekend, ALOHA! Pumped 4 Passover will take place on Tuesday, April 9 at 4:30 p.m. at Chabad Jewish Center. The event will include hands-on Seder crafts, Matzah Ball making, holiday games, stories, and a Matzah ball raffle, and is suitable for children of all ages. Chabad will also host a Community Passover Seder on Friday, April 19. The evening will begin at 6:30 pm with hors d’oeuvres and candle lighting. Experience a wonderful evening spiced with traditional customs, a delicious full course dinner, handmade Matzah, fine wines, and great company. The cost is $25 per child, $45 for adults, and $180 for sponsorship. RSVP is necessary by March 15. To RSVP and for complete Passover schedule information and Yizkor memorial services, visit the Chabad website at www.chabadoflaguna.com or call the office at (949) 499-0770. Chabad is located at 30804 S. Coast Hwy, across from the Montage Resort. On April 13 from 9 - 10:30 a.m., view live sea lions, learn about the rescue and rehabilitation efforts of the Pacific Marine Mammal Center, then learn to paint a curling wave in acrylics in an easy step-by-step process with local artist Mary Gulino. The workshop includes a docent led tour of the Center and a close up view of seals and sea lions. Following the tour, artist Mary Gulino will teach a liquid acrylic painting workshop where she will guide guests through a simple painting of a curling wave beginning to crash. Participants will take home their work. Beginners, families, and groups are invited. All supplies are included; free on-site parking is available. The cost is $15 for children ages 6 to 18 and $20 for adults. An adult must accompany children. For more information on artist Mary Gulino, visit www.myartistloft.com. LOCA Arts Education is a nonprofit coalition of arts educators, professional artists and advocates interested in arts education for people of all ages. The nonprofit has been serving the community for over twenty-five years. Pacific Marine Mammal Center is located at 20612 Laguna Canyon Rd. On March 28, Assistance League of Laguna Beach (ALLB) joined representatives from the Capo Valley Assistance League to participate in Diaper Day, which is a Chapters for Children event. Diaper Day is held two times each year at Camp Pendleton and is open to Military Families. Diaper Day focuses on providing clothing, supplies, toys, and books to babies and toddlers from Military Families. Assistance League of Laguna Beach gave diapers, baby wipes, books, and activity boxes to babies and toddlers who attended the event. Other organizations provided knit hats, quilts, toys, and clothing. The items are new and are provided at no cost to the Military Families. Families received huge bags – one for each baby or toddler. Knit hats, quilts, toys, books, diapers, baby wipes, and clothing were displayed in stations, which families moved amongst to “shop” for items to fill the bags. Each parent went home with a bag filled with goodies and supplies for their little ones. For more information on the ALLB, go to www.allagunabeach.org.